This recipe has been sponsored by Martin’s Famous Potato Rolls and Bread. All opinions are my own. 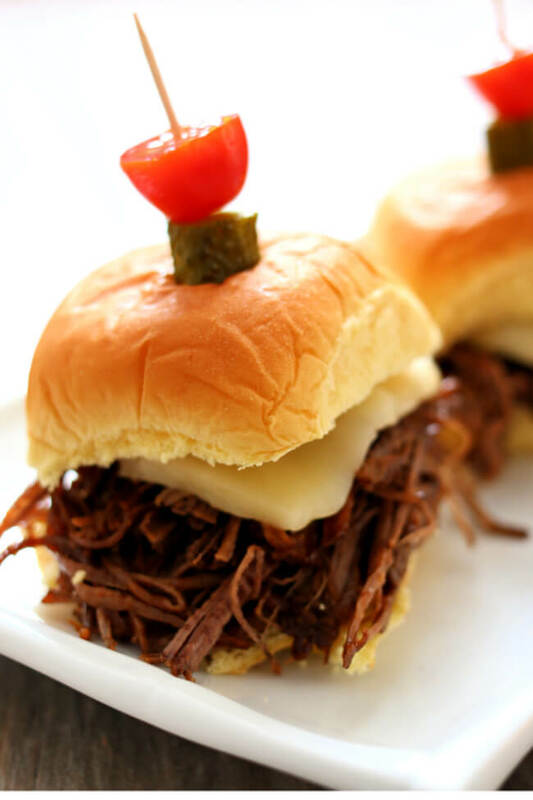 Instant Pot BBQ Brisket Sliders–tender and moist shredded or sliced beef brisket piled on a soft roll and topped with a slice of pepper jack cheese. A perfect recipe to make for game day. 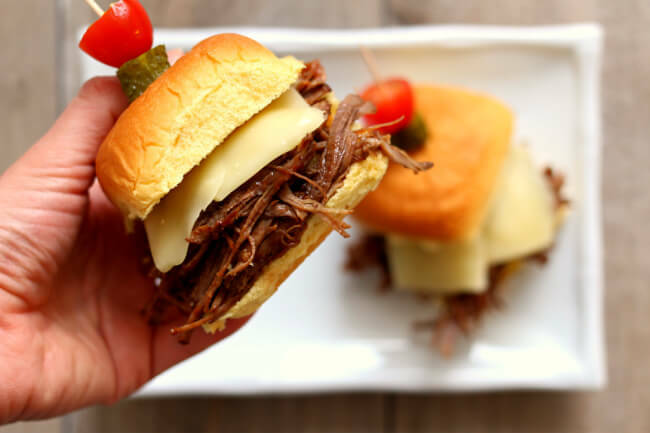 If you’re hosting a party or simply want a delicious dinner consider making these Instant Pot BBQ brisket sliders. 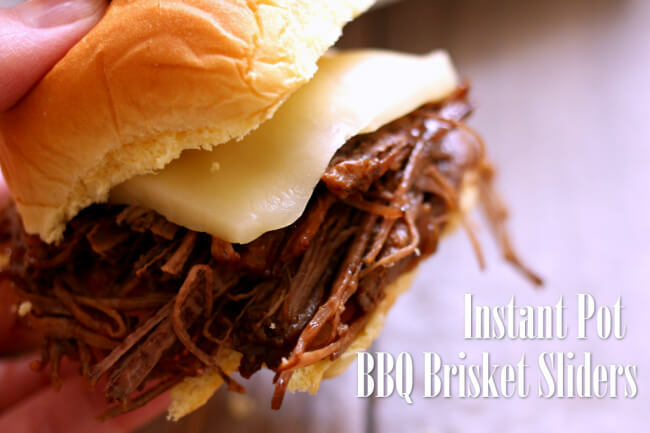 You will be amazed that a brisket can become shreddable and fork tender in less than 2 hours total time thanks to your Instant Pot. You can make the sliders as fancy or as plain as you want. I added a slice of pepperjack cheese and squirted a little bbq sauce over the meat. You can add a pickle, tomato and some mayo too if you want to go all out. One thing you really need to consider is the roll that your brisket sliders will be served on. Don’t settle for a sub-par roll. Use Martin’s Dinner Potato Rolls. They are soft and taste amazing. They are like a hug for your sandwich. 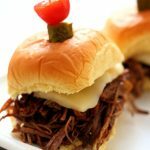 I love making these sandwiches on these small dinner rolls because it means you can have more than one sandwich! Whether you choose Martin’s Dinner Potato Rolls, their Sandwich Potato Rolls or their Long Potato Rolls you know you’re getting a quality bread. What makes a perfect roll? 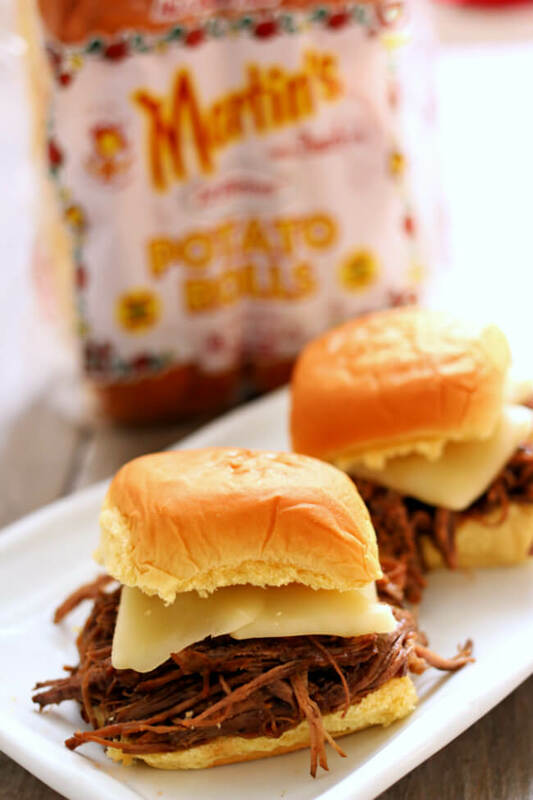 Tender and moist shredded or sliced beef brisket piled on a soft roll and topped with a slice of pepper jack cheese. A perfect recipe to make for game day. Cut all the excess fat off of the brisket. This a little bit of time. I used latex gloves and a sharp knife to slice off the fat cap. I was left with about 2 pounds of meat after I cut off all the fat. Massage seasoned salt into each side of the brisket. Turn your Instant Pot to the saute function. When the display says HOT add in the oil and swirl it around. Lay the brisket into the pot and let it sit for 5 minutes. Use tongs to turn it over and let the other side brown for 5 minutes. Remove the meat from the pot. Deglaze the pot with the beef broth. Scrape the bottom of the pot until it is clean. Add in the onion chunks. Lay the brisket on top of the onion. Drizzle the liquid smoke and Worcestershire over the brisket. Cover the pot and secure the lid. Make sure valve is set to sealing. Set the manual/pressure cook button to 60 minutes for sliceable brisket or 70 minutes for shreddable brisket. When the time is up let the pot sit for 10 minutes and then move the valve to venting. Remove the meat and place it on a cutting board. Tent it with foil and let it rest for 10 minutes. Shred or slice the brisket. Salt and pepper to taste. Pile the meat on a roll and top with a bit of barbecue sauce and a slice of pepper jack cheese. Enjoy! It can be hard to find a 3 pound brisket. Many times they come in huge amounts (like 15 pounds). I asked the butcher to cut a large one into 3 pound increments. He was happy to do it and then he repackaged the meat. To make gluten free: Double check your beef broth to be sure it is gluten free. Swanson’s Organic Beef Broth says gluten free and no msg right on the front of the box. You can find gluten-free buns in the freezer section at many grocery stores. Kinnickinnick and Udi brands are good. Chick-fil-A has gluten free buns that are soft and delicious! You can purchase them alone for about $1. Can i double this recipe? Would it fit in my 6qt Ipot? You can double it as long as it doesn’t go over the max fill line or 2/3 full. What part of the brisket works best? What setting do I set the pressure cook for normal or more (high)? I had to substitute with a 3 lb chuck roast- is the cook time the same? Do you think I will get the same result? Thanks! It will be a very similar cooking time. It won’t be brisket but it will still be delish! When doing the pressure cook button do I leave it on normal or high to pressure cook it. For about 1lb of meat would the cook time be the same? Thank you! Yes I’d keep the time the same. I have an old fashioned prrssure cooker, do you think it will work with it also? I am really inexperienced with old fashioned pressure cookers so I bet it would work but I am not sure on the time. It may need more or less. Love, love, love Martin’s Potato Rolls. I have served them in my home for more years than I’d like to mention. 😎 I can’t wait to get to the grocery store to pick up the ingredients for this one! I can tell by the ingredients that this one is a keeper.